Alexandria A's defeat Senators Baseball Club 9-7 in league opener. 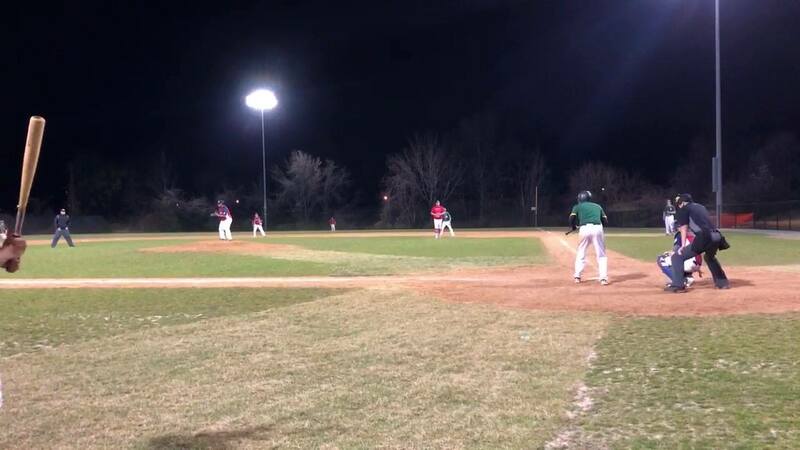 The 2019 DC wood baseball season began with the annual opening night matchup between the Senators Baseball Club and the Alexandria A’s Thursday night at one of league's more prestigious ball parks, Montgomery Blair High School. It was a beautiful night for some baseball and both teams would come into the season with their bats hot. Defensively, the perennial opponents appeared to be in mid-season form, with a few diving catches early on by the A's fielders, and two double plays by the Senators' defense. A's Rafael Hernandez squares up to bunt with runners on 1st and 2nd with no outs in the 8th inning, against the Senators' Lozado. Both runners would score. With first pitch at exactly 8pm, A’s leadoff hitter, and their very talented ace on the mound, Taylor Bryner would take the first pitch of the season for a ride, hitting a booming double off the left field fence. The rest of the A’s lineup would set the tone for the night, plating Bryner and two more runs on four hits to start the game. The Senators bats, led by DH Shane Ittenbach who finished with two RBIs on two hits, would start slow but heated up quick. SBC tied the game in the fourth inning and the teams traded two runs each in the fifth to go into the latter half of the game knotted up at five. The SBC took their first lead of the game after a base hit by LF Johnson, who would score on a booming double by 1B Woodring, who was making his DC Wood debut. However, that lead was short-lived as the A’s bats, led by LF Manny Rivera’s four hits and 3B Damon Cruz’s three hits would score five more runs to lock down the opening night win, 9-7. Senators Ace, Ray Hart struck out six over 6 2/3 innings, recording the loss in the game while A’s winning pitcher Hernandez struck out 2 in two innings of middle relief. Bryner would re-enter for the last out of the game, throwing one pitch for a ground out and recording the save with the Senators threatening with bases loaded. Both teams will take the field again against each other on Sunday in the second game of the DC Wood's Opening Weekend event at Nationals Youth Academy, at 1pm.